Convert Your Existing 401K/IRA into a Gold IRA!!! It’s Legal! US Government Gives OK! It’s Easy! Let Liberty Gold and Silver Show You How in One Phone Call! Protect your hard earned IRA with gold. It has taken you years of hard work to build and accumulate your retirement fund and increase your net worth, but the continuing world financial crisis could put you at risk for the destruction of your paper assets. A failing currency can lead to financial ruin for everyone who is not prepared, making you a candidate for bankruptcy. The facts do not lie. 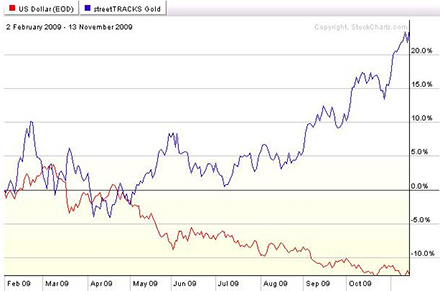 As you can plainly see from the two charts above, over the last few years, gold has decisively outperformed paper equities and risen dramatically against the dollar. All dollar denominated assets, be they cash money markets, CDs, bonds, etc., have declined whereas gold (and silver) have surged ahead in value. This trend is likely to continue for some years. If you are a traditional investor, the recession in which we all find ourselves may have already caused a sizeable draw down in your portfolio. Further erosion of the US economy, its banking system, and its currency, could well cause utter devastation to the value of your paper assets. Do you have a plan to protect yourself? Your retirement account is at risk, if it is comprised of cash, securities, or money market funds. However, you can TAKE ACTION TODAY by protecting your Individual Retirement Account (IRA) well before the mainstream financial markets plunge further. Converting your IRA into gold and silver ownership is one of the most effective and reliable ways to protect your savings. It is also very quick and easy to accomplish. After you have made the gold/silver IRA transition, the peace of mind will be priceless. Fact #1: Since 2000, gold and silver have appreciated an ASTOUNDING 400% plus! No other asset class has come close! Fact #2: Gold bullion is considered by economists to be the foundation of the traditional Investment Pyramid. It is so because of its low risk attributes. Fact #3: Gold has traditionally maintained its purchasing power. As an example, during the heart of the Great Depression in 1935, you could buy a nicely tailored men’s business suit for around $35, the price then of an ounce of gold. Today, with gold at over $1,100 an ounce, a comparable business suit will still cost you just one ounce of gold. GOLD PRESERVES WEALTH AND PURCHASING POWER! Fact #4: Gold and silver are the only LEGAL TENDER and recognized money under the Constitution of the United States. They are the only form of REAL MONEY. US Federal Reserve Notes (a “note” is the term designating debt) on the other hand, have had their purchasing value eviscerated. Since its inception in 1913, Federal Reserve currency has lost over 98% of its original purchasing power. Since 1970, the Federal Reserve US Dollar has lost more two thirds of its value. THIS TREND IS NOW ACCELERATING EXPONENTIALLY. Fact #5: The world’s central banks, along with the International Monetary Fund, are now openly discussing the removal of the US Dollar as the world reserve currency and establishing a new one in its place founded upon gold. The gold standard now has a very real chance of becoming the new backing for all global currencies and may well become the foundation for the world's monetary and banking system. The Tax Payer Relief Act of 1997 allows you to purchase specific types of gold and silver and place them into your investment retirement account. This can be done by simply rolling over your 401K (if it is not directly tied to your present employment) into a self–directed IRA. If you already have a non–self–directed IRA, you can easily transfer it to a self–directed IRA custodial administrator. You then instruct your custodian to purchase specific gold and silver bullion for your account. It’s that easy! In only a few days, you can protect your assets with gold and silver and have them maintained in a tax deferred account without any penalties whatsoever. Liberty Gold and Silver is pleased to be affiliated with two excellent precious metals IRA custodians, GoldStar Trust Company in Canyon, Texas, and The Entrust Group Precious Metals Center in Reno, Nevada. Both companies offer outstanding service and very reasonable fees along with a wealth of experience in the administration of precious metals IRAs. Liberty Gold and Silver is a registered dealer with both GoldStar Trust and The Entrust Group. For further information regarding either of these companies, please click on the logos below. DON’T DELAY ANOTHER DAY! The value of your paper currency assets is declining steadily. PROTECT YOUR WEALTH BY ESTABLISHING A GOLD IRA TODAY! Liberty Gold and Silver LLC is a precious metals brokerage company that wishes to help you create a bullet proof financial future for you and your family. 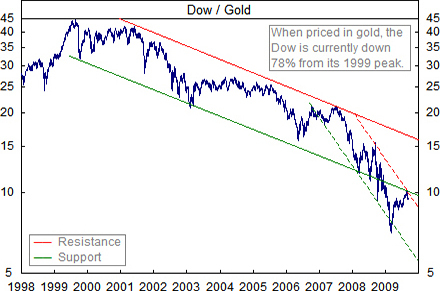 To receive more information on how to take advantage of the burgeoning precious metals markets and set up an IRA precious metals investment account, please contact us at http://libertygoldandsilver.com/contactus.htm today. If you wish, feel free to call 1.888.751.3330 and ask to speak with a representative about setting up a Gold IRA.